Those are the three words that Executive Chef Andrew James Eades (more affectionately known as “Bubba”) uses to describe the soon-to-open Moscow Tea Room. The Moscow Tea Room (MTR) is, conceptually, a stylized tea room by day, offering a vibrant setting for light lunches, pastry pick-me-ups and meetings over a grand tea and coffee selection. By night, however, this pretty room sounds like it will be turning its tables into an escape from the mundane. Attracting after work crowds to the very late night owls (with a late night kitchen open until 2am), these guests will be tempted by late night eats from charcuterie, caviar and cheese plates to the extensive selection of libations including a vodka and champagne list to be reckoned with. Set to open on Sussex Drive, owner Abbis Mahmoud seeks to bring Ottawa a unqiue destination for the 30 something crowd and, with Mark McLachlan running the front of house operations, expect the vibe (and playlist) to match the unqiue culinary experience that has been hyped for MTR. But who is the man at the helm of this tea room’s kitchen? The man who has “BUBBA” tattooed across his chest, not to mention an impressive spread of body art from fingers to neck. A relatively young chef, but one who has put his time in with a myriad of restaurants in Ottawa, we were curious to know more. In a nutshell sat down with Andrew James Eades for a quick Q&A session and what we found was a peek into what will make the Moscow Tea Room tick. Q: First off, Andrew – or do people still really call you Bubba? Q: Ok, so Bubba, where did you grow up and what brought you to Ottawa in the first place? A: I grew up in a small town about an hour away from Ottawa called Shawville. I had been working at The Black Tomato, the commute was long and I had also enrolled at Algonquin College and was about to begin the Chef Training Program, so living in Ottawa was the next logical move for me. I moved here when I was 20. As much as I love the country and my small town, there’s certain opportunities that only a bigger city like Ottawa could present me with. Ottawa is a great city, I love watching it grow and flourish into one of the greatest cities in the country, and I’m excited to be here to experience it. Q: And since The Black Tomato days, what has added to your culinary background? A:The past few years I’ve been mostly working in Italian based restaurants. I love Italian, they have a great food culture, but at the same time I’ve been able to explore lots of different styles and ideas. The Black Tomato was a great influence in the early stages of my career, they really incorporate lots of different concepts instead of going with one specific style of cuisine. It’s fun to be able to play with and explore lots of different foods and ideas. Q: So how did you get invovled in Moscow Tea Room? A: Through my good friend Mark McLachlan. I’ve worked with Mark in the past, he’s a great personality and a hard worker. I’m very much looking forward to working with him again. We’re building a great team, it’s going to be a lot of fun. Q: A lot of fun and a lot of work indeed. Have you pinpointed an opening date yet? A: We will be announcing the official opening date by the end of the week. Q: Alright lets talk menu then. A:The idea behind this menu is simple, great food. There’ll be some great lunch options that will include an in-house roast beef sandwich, another that will feature smoked sturgeon. There’s a number of salads also that have been included as great, fresh, healthy choices. Late night menu will include charcuterie and cheese boards, some desserts, and small plates. Q: Why were you chosen to spearhead the kitchen? A: Well I can’t speak for anyone, but I pride myself on the fact that I’m dedicated, I work hard and take a lot of pride in my food and my kitchen. I can’t wait to help Moscow Tea Room develop into a staple here in the market of downtown Ottawa. It’s a great opportunity that I’ve been presented with. I plan on making the best of it. Q: Why does Ottawa need a place like MTR? A: There is a lack of places for people over the age of 30, people who are affluent, have established careers, have families, for them to go out and enjoy a great evening. Our group owns multiple venues in the city and a growing number of our clientele were asking for such a place as this, a place where a person can socialize and network during the day as well as be an escape from the mundane at night. Somewhere where excellent service, food and drinks also comes with a smile and without pretention. We have built such a place. Q: Do you think there are any major competitors with MTR in Ottawa? A: We feel that our concept is quite original. I do not believe anyone encompasses all that we do. We have award winning teas, an extensive selection of coffees, small plates, pastries, sandwiches, salads, charcuterie & cheese boards, caviar, a cocktail menu that is at the forefront of the Mixology culture, the largest selection of vodka and champagne in the city, a spectacular décor and a beautiful patio. Being open daily from 11am-2am, we can cater to anyone whether it is someone that needs a quick coffee and muffin while he catches up on some emails to the man who wants to spend a couple hours playing chess on our patio on a sunny day or to an after work crowd who want to network and unwind after a day with some light snacks. Finally, we cater to the late night crowd that want to experience a great vibe, listen to amazing music and be surrounded by fashionable, stylish and cultured people. I don’t think anyone in the city encompasses all these facets of hospitality in one venue. Q: Is there any one chef in the city you would trade shoes with for a day? A: Tough question. 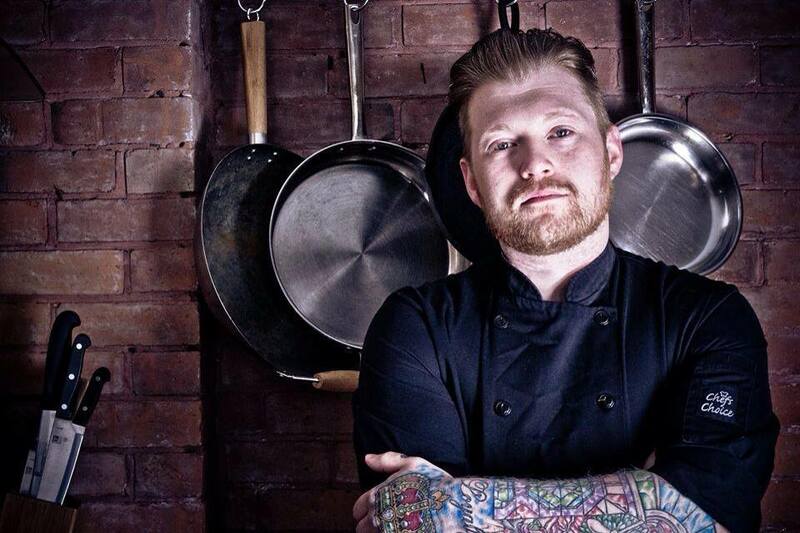 There’s so many great chefs in Ottawa now. The city has really grown in the last five years, lots of great establishments have popped up all over the city, with tons of culinary talent going into them. The culinary scene in Ottawa has really grown into a family, everyone is very easily accessible and eager to help, which is a huge bonus for a young chef like myself to learn and grow from. In a nutshell expects to see some interesting things emerge from the Moscow Tea Room, especially with Chef Bubba behind the wheel and a stellar team to back him up. And although this may be his first true venture captaining a kitchen, something tells us there will be much more coming from this young Ottawa talent in years to come. Follow Eades on Instagram @devilinthekitchen and Moscow Tea Room @moscowtearoomottawa. Impressive concept & I am eager for the MTR’s opening with Chef Bubba. Sounds like a dream come true! ← Bluesfest 2014: Who are YOU excited for?